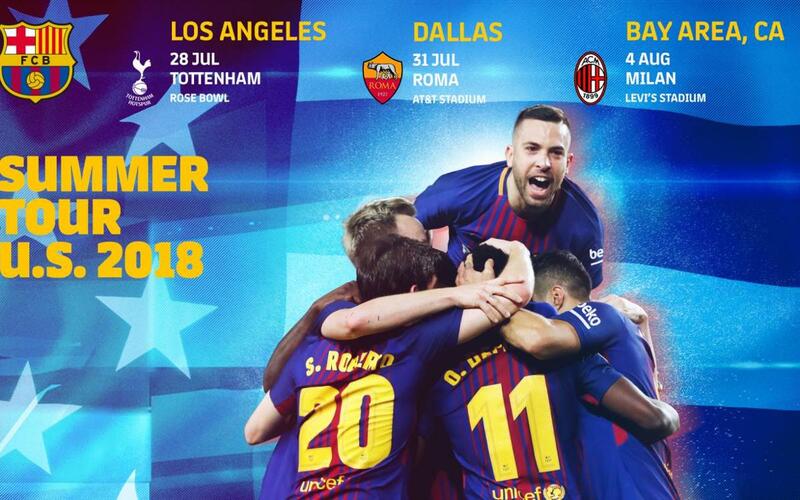 Tottenham Hotspur, AC Milan and AS Roma will be FC Barcelona’s preseason opponents in this summer’s North American International Champions Cup (ICC), a competition organized by Relevent Sports and that’s being held for the sixth time this year. Both the match-ups and the dates for these games were announced this Tuesday in Miami at an event attended by the 18 participating clubs. FC Barcelona was represented by its vice-president Manel Arroyo and former player Luis Garcia. This will be the eighth time that FC Barcelona have visited the United States for pre-season. In 2003 Frank Rijkaard’s team played three matches in the US against Juventus, AC Milan and Manchester United. Three years later, the blaugranes faced Chivas Guadalajara, América and the New York Red Bulls. Then in 2008, the first season under Pep Guardiola, FC Barcelona returned to the States to take on Chivas Guadalajara and New York Red Bulls. A year on, LA Galaxy, Seattle Sounders and Chivas Guadalajara were the rivals on that tour. Manchester United, Chivas Guadalajara and Club América all faced the blaugranes in 2011. Finally in 2015, Barça faced LA Galaxy, Manchester United and Chelsea. Barça won the preseason tournament last summer, beating Juventus in New York; Manchester United in Washington D.C.; and Real Madrid in Miami. This last match was just the second El Clásico ever played outside Spain. FC Barcelona’s pre-season visit to the Midwest and West Coast of the United States falls within the confines of the organization’s Strategic Plan for global expansion. From Barça’s perspective as a global brand, the American market is of priority interest for the Club due to the sport’s strong growth there. It further illustrates the Club’s desire to increase its fan base in a market where the sports industry is well developed and is highly competitive. Moreover, this visit gives the Club an opportunity to generate new financial revenues stemming from the economic strength of the U.S. market and bring it closer to its strategic partners, as well as possible new sponsors.